Straps to Go produces sail ties from both polypropylene and polyester webbing. The standard webbing width is 1″ although we can make them whatever width you want. I am a bit “old school” and like to keep my sail ties simple. Just a length of webbing with a loop sewn in one end works for me. A bit better is to have the webbing in the loop twisted so that the eye stays open when you are trying to thread the other end through. 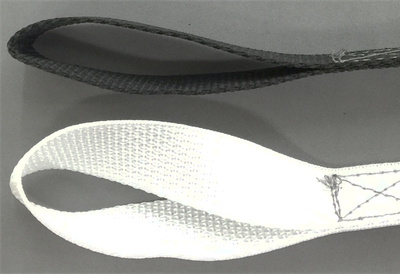 On the left you have a sail tie with a twisted loop, on the right (the black strap) the loop is not twisted. The side view shows how the twisted loop in the white sail tie stays open even if the loop has been pressed closed. Others like to have a buckle on their sail tie, once adjusted all you have to do is snap is shut. We have had customers buy these ties in different colors so that they know that the blue ones are the longest, red are a a medium length and black are the shortest (or whatever colors suit your fancy). The sewing on all of our sail ties is done using polyester thread with advanced UV protection. It is made in the USA by A&E and is a TEX 90 size. We use a Box-X stitching pattern. Polypropylene webbing is the standard we use. It is inexpensive and doesn’t adsorb water which is also nice and comes in a bunch of colors. What polypropylene doesn’t like is sunlight. It will degrade if you don’t cover your sail ties with a sail cover. Polyester webbing will stand up to ultra-violet exposure. It will adsorb a bit of water, more than polypropylene but much less than nylon. We only carry this webbing in black and white. Our white polyester webbing has a much better feel to the hand than the black so it would be my choice if I were replacing my sail ties. Over the years I have sailed on boats with a bunch of different solutions for sail ties. The most basic, just a length of webbing with no eye works fine but is a bit more difficult to get secured than webbing with an eye in one end. Elastic cords were the rage for a while as was my black eye when I got hit from one of the plastic balls on the end of the cord. Then there were the contraptions that went from your mast to the end of the boom with a number of elastic ties hanging from them. Once you had these untangled and installed, the rest of the crew was cleaned up and in the bar. In either case they will be promptly produced and shipped to you. We ship using Priority Mail which is speedy and only costs $7.00 no matter how many you order. Questions? Give Rollie a call at (253) 627-6000. 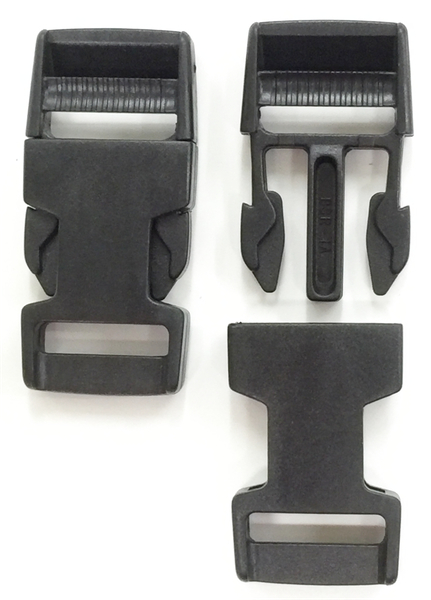 American Cord and Webbing is the manufacturer for the popular GM series of center release buckles. Originally designed for the military these buckles have found their way in to numerous uses both on land and at sea. We stock these in both 1″ and 2″ versions. As its name suggests, the GM-1 is designed for 1″ webbing. We stock it in black. 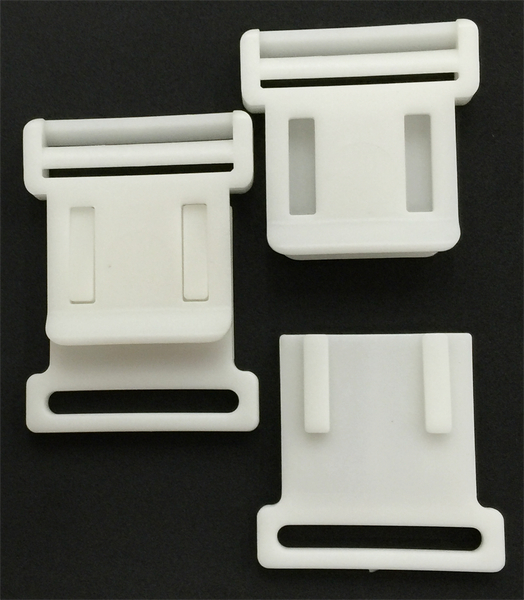 The GM-2 which fits 2″ wide webbing is available in white. We have good inventory levels on both the 1″ and 2″ versions. A while back I wrote about how the GM-1 buckle is used to restrain stern ladders on some Boston Whaler boats. 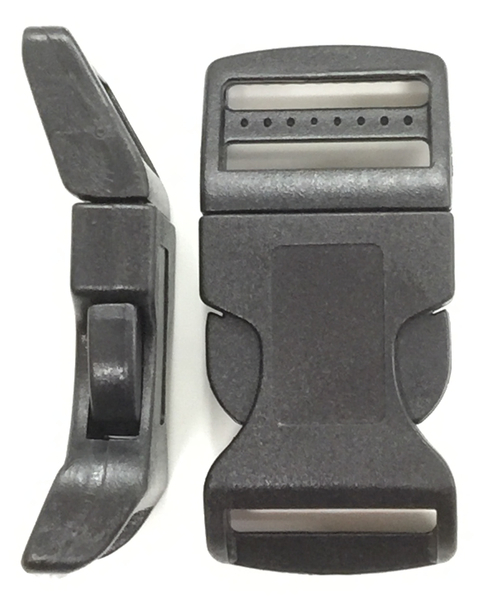 The buckle is coupled with a short length of polyester webbing and if you need one of these, just give us a call at (253) 883-5800. 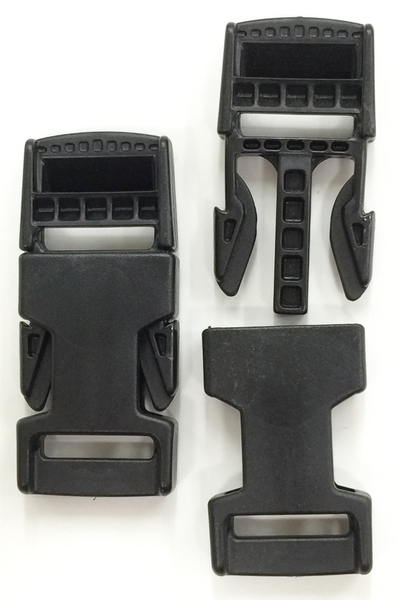 Straps to Go stocks side release buckles for 1″ webbing in many different configurations. All are manufactured by American Cord and Webbing (ACW). 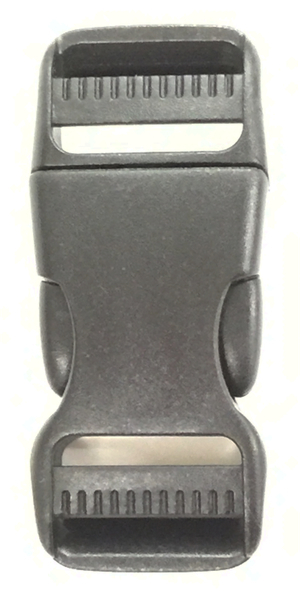 The BSR version is the most common found in the field. It is also the one buckle where there is a good possibility that different manufacturers components will work (how well is a different story) together. The CSR version is what we sell the most of today. It is a bit nicer looking than the BSR and the edges are rounded so stuff just might not catch on. 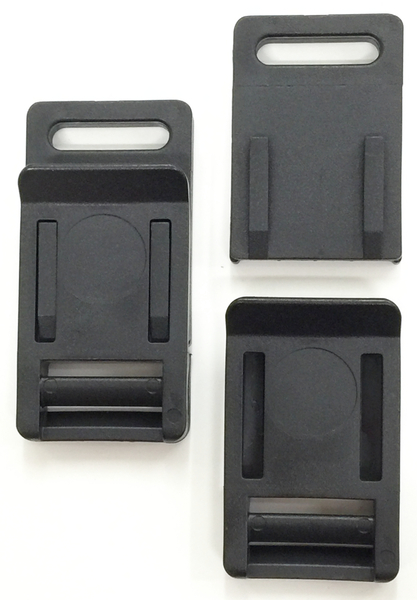 The CSR buckle also comes in a double adjust version. With this buckle you don’t need to sew the webbing to the female half, you can just thread it through. The Type V version of the BSR is primarily used on life jackets. It is larger than the standard BSR and a bit stronger too. Want to make a pet collar? Then the curved version of the BSR is just the ticket. 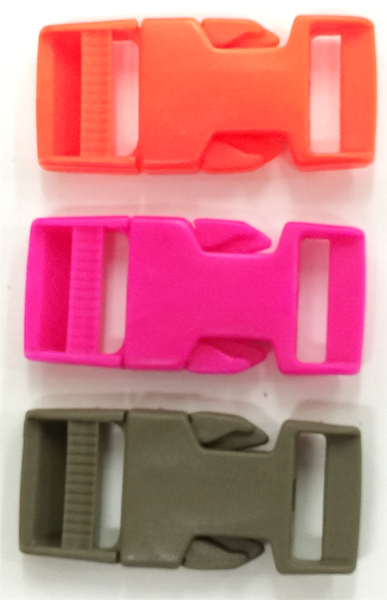 Finally we stock the BSR model in a number of colors other than black. On the bottom is the popular coyote tan color, and we also have nylon webbing to match. Above that we have hot pink and bright orange both of which we have a limited supply at fantastic prices. One word of warning, the pink and orange colors will fade if left exposed to ultra-violet light. Is there such a thing as bad thread? 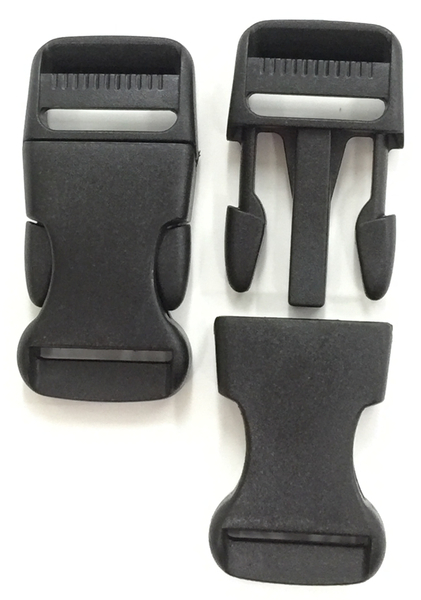 We received an order to produce a bunch of straps from polypropylene webbing. I loaded the sewing machine up with a fresh pound of polyester thread, wound a bunch of bobbins and thought I was at the start of a productive day. By the end of the day I was confused. Nothing was working right and I had spent the day trying to get my machine to sew. Thread tensions were checked, knives for trimming the thread were replaced, manuals were read and after work a cocktail or two were consumed. Not having long hair at least I didn’t have to worry about pulling it out. Day two wasn’t any better and by mid-afternoon the frustration had really kicked in. I called my thread supplier and they informed me that their supplier had been having problems and I was not alone in having real issues. They gave me a credit for the bad thread and said they were changing suppliers and did not have a similar thread in stock which did a great job of raising my blood pressure. After some discussion we decided that the particular project I was working on would be just fine if I switched to nylon thread. The next day five pounds of thread came in the door and with great trepidation I wound bobbins and tried to make some straps. Lo and behold everything worked, stitching was fine, thread cut properly and my blood pressure returned to normal. I was getting near the end of this project, the webbing straps were coming off the sewing machine but I was running out of thread. A quick call and I found that my supplier had received their polyester thread in the size and color I needed. The order was on its way and by the next afternoon I was winding bobbins and switching over. It was a nightmare, bad enough that I called the company who sold me the sewing machine a few years ago. The fix was simple, well it should have been simple. The new thread suppliers product was small in diameter than what I had been using which required a different size needle. Good luck finding industrial sewing machine needles in Tacoma but finally I located one and was back in production. I also learned that a lot of the thread now comes from overseas and is very inconsistent. Upon asking what brand of thread the sewing machine company recommended I found that it was the brand my thread supplier had switched to, A&E which is still made in the US. It always feels good to support businesses based in the US. So the answer to the question is yes, there is such a thing as bad thread. Quality control at the time of manufacture, age (that box grandma had might not work that well) along with storage conditions can all turn a good day into a nightmare. Posted on November 2, 2015 Categories UncategorizedTags polypropylene webbing, thread, webbing strapsLeave a comment on Is there such a thing as bad thread?